Leather vambraces were once worn by medieval archers to protect their arms from bows and arrows. They weren’t designed to be effective defense weapons – chain mail and armor offered much better protection from enemies – but the vambraces kept bowmen from being stabbed when reaching into their quiver or handling their bowstrings. Their durability and comfort on the battlefield ensured their success, and many archery enthusiasts still use modern versions of vambraces today. Some even prefer the medieval style! If you’re building an archer’s costume or getting ready for that LARP, leather vambraces will go a long way toward not only making you look the part, but feeling it, too. Our vambraces are comfortable and work well with a wide variety of outfits. Both our traditional leather vambraces and the more stately leather swordman vambraces make excellent additions to your medieval clothing collection. Our gothic leather vambraces are made from three levels of top grade leather fashioned into a jagged gothic-era design. You can select medium or large vambraces, and their heavy duty straps and buckles make sure they stay on your arms with a snug fit. 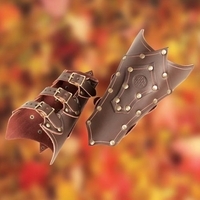 Available in brown or black variations, our gothic leather vambraces are perfect for any period or fantasy costume. Vambraces are often the kind of accessory that transforms a costume from looking adequate to being impressive. It’s the kind of detail that a novice might overlook, but you can add these protective arm coverings to your outfit for a relatively little charge. You may find modern uses for them outside of archery, or you may simply reach for these vambraces when you wish to protect your arms hiking or out in the garden. For Harry Potter fans, our Deatheater belt and vambraces set also features leather vambraces. These hand-detailed vambraces have silver designs which complement the gambesons worn by the Deatheaters. If you’re going for the most authentic Harry Potter look, these complete the Deatheater outfit! Find the leather vambraces you need for your medieval costume or LARP outfit at PearsonsRenaissanceShoppe.com today. Our vambraces are light, durable, and comfortable to wear, so don’t miss the mark. Get into character with leather, swordman, gothic, or Deatheater vambraces from Pearson’s.